Non-religious pro-lifers contend you don’t have to believe in God to know the unborn have rights. Although Rossi seems to think his analogies are comical and highly effective, they are actually inapt. Pro-life atheists do not claim God created prenatal children, that he endowed them with souls, or that he even exists. Instead, pro-life atheists, agnostics, and secular people argue that prenatal children are human beings who have rights, and that to abort them is wrong. Kelsey Hazzard is a 24-year-old, pro-life University of Miami alumna and recent graduate of the University of Virginia School of Law. She was raised in the United Methodist Church, but as an adult began having doubts about God. In 2009, Hazzard founded Secular ProLife (SPL), a group whose vision is “a world in which abortion is unthinkable, for people of every faith and no faith.” Hazzard, SPL’s president, created the group in part to attract non-religious people to the pro-life movement. Hazzard points to opinion polls showing the US becoming less religious but more pro-life as compelling reasons to use secular arguments to support the pro-life position. SPL, with a membership made up predominately of college-aged students, has participated in the annual March for Life and the Students for Life of America Conference. Last year, SPL attended the American Atheist Convention in Washington, DC, which included Richard Dawkins among the attendees. SPL also sent a representative to the Texas Freethought Convention last year. 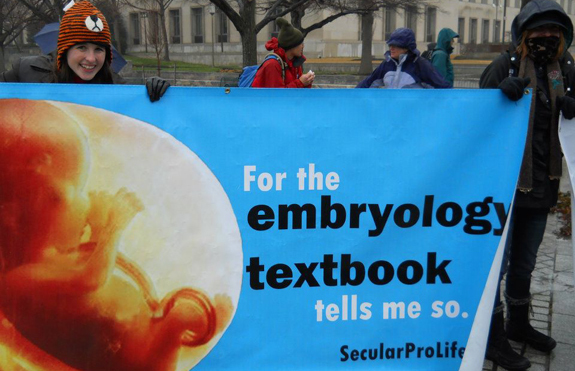 According to SPL member Julie Thielen, who identifies as a gnostic antitheist atheist, the best ways to reach secular people with the pro-life message are through biology and an appeal to human rights. For many, the historical argument for human equality is the strongest secular argument in favor of life. Some pro-choice atheists have expressed skepticism about Secular ProLife, pointing to an old article in the Miami Hurricane, the University of Miami’s college newspaper, in which the student pro-life group was featured and Hazzard misidentified as Catholic. “I understand their skepticism, but I’m not Catholic and never have been,” Hazzard said. The idea of a pro-life atheist is not new, as Doris Gordon’s story proves. For Gordon, a Jewish, atheist libertarian and former elementary school teacher, it all began in 1959 when she read Atlas Shrugged by Ayn Rand. Ironically, although Rand and her associates were adamantly pro-abortion, reading Rand set Gordon on the path to becoming a fervent pro-lifer. This novel introduced her to Rand’s philosophy, objectivism. Interested by what she read, Gordon was eager to learn more. In 1960, she took the 20-lecture course “The Basic Principles of Objectivism” by Rand’s then-closest associate, Nathaniel Branden. Things began to unravel in 1967, however, when Gordon attended a talk titled “Certainty v. Omniscience” at an objectivism conference. The talk was given by Leonard Peikoff, a member of Rand’s inner circle and the sole heir to her estate when she died. “Following the talk, during a Q&A period, a questioner angrily challenged [Peikoff] about abortion, and a big debate broke out among the audience and the conference speakers on the topic. One point of disagreement was on when the new human being begins to exist,” Gordon said. “Well, Rand taught us to think for ourselves, so when I went home, I began to do so. My studying objectivism taught me something about logical reasoning,” Gordon said. She asked herself if there was any essential difference between the moment before she was born and the moment immediately after. She could not think of any. What about at the junction between the eighth and ninth months? No. From there, she worked her way back, month by month, to see if she could find any essential difference. She could not, until she got to the point of fertilization, where something essentially different occurs: the sperm meets the oocyte, then growth and development can begin. “It has long been settled by science that in sexual reproduction, the new human organism, a human being, begins to exist and to grow and mature into an adult. On the other hand, individually, neither a sperm nor an oocyte has the capacity to do the same. Logically, therefore, the human zygote is already a living human being,” she said. But there was a problem: “What about the mother’s right to control her own body, her unalienable right to liberty?” The child’s right not to be killed seemed to conflict with the mother’s right to control her own body. In 1973, Gordon wrote a letter that was published in Reason, which stated that unwanted pregnancy presented an insoluble conflict of rights between woman and child. She argued that “the unfortunate child was unaware of what was happening, and after all, the mother was in existence first.” For nine years, Gordon remained on the “abortion-choice” side of the debate. Then one day she thought back on an article by Branden she read in The Objectivist Newsletter, titled, “What are the respective obligations of parents to children, and children to parents?” In a response to a reader’s question, Branden stated that, like it or not, parents have the obligation to take care of their children. “The key to understanding the nature of parental obligation,” he wrote, “lies in the moral principle that human beings must assume responsibility for the consequences of their actions.” He insisted that the basic necessities of food, clothing, and so forth are the child’s “by right.” This helped Gordon begin to see why there is no conflict of rights between mother and child. Gordon understood Branden’s argument for parental obligation was about born children only, but she wrote to him to ask whether it could apply, in principle, to children before they are born. He wrote back saying it can’t because they are not yet human beings. She wrote back to Branden asking him for his definition of “human being,” but he never replied. Gordon, a member of the Association of Libertarian Feminists (ALF), agreed to handle publicity for a panel discussion the group was planning for the 1976 Libertarian Convention. By the time the convention rolled around, Gordon had become a pro-lifer, and tried to talk about abortion and her move to the “other side” to Sharon Presley, one of ALF’s founders and a pro-choicer. Presley, who was setting up an exhibit table, brushed Gordon off, claiming she was tired and had not given much thought to the debate, which shocked Gordon. Presley suggested Gordon talk to her expert on the topic, Lucinda Cisler, who was one of the organizers of the New York chapter of NARAL, originally the National Association for the Repeal of Abortion Laws. “That was Strike One,” Gordon said. The experience inspired Gordon to join with other like-minded libertarians to form Libertarians for Life (LFL). “LFL was different from other pro-life organizations in that we seemed to be alone in focusing on why the so-called woman’s right to control her own body is false,” she said of her group. Another person who proves that being pro-life is not just for the religious is Nat Hentoff. Hentoff, a Jewish, atheist liberal, is a veteran journalist of 60 years, having written for the Village Voice and the Washington Post. He changed his mind about abortion while writing a news story many years ago. “I was doing a story about a very young child in Long Island who had spina bifida, and the parents decided they would not treat her anymore, because she would not recognize them and would never be able to communicate with them,” he said. Hentoff said he read books by physicians who treat babies and their mothers at the same time and—although they did not specifically use the term “pro-life”—it was clear the authors held that a living human organism should be recognized as a human being. “That made me pro-life,” he says. Hentoff encourages anyone who wants to find secular information to support the pro-life argument to read works written by doctors who operate on babies in utero. “Read them in terms of what they do—surgeons who deal with the child before the child is actually a child, according to the law,” he said. Being an atheist pro-lifer often can have its costs. Hentoff has lost lecture-circuit jobs and the opportunity to have a journalism school named after him and was delayed in getting a Lifetime Achievement Award from the National Press Foundation because of his pro-life views. “Being pro-life has cost me a lot, but these are losses I am proud of,” he said. According to some atheist and secular pro-lifers on the Internet, not all Christians have welcomed their collaboration. 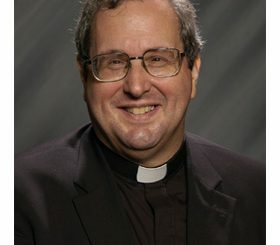 Some believers have even urged them to “go get their own events.” This type of response does not help advance the cause of the pro-life movement, according to Dr. Francis Beckwith, who teaches philosophy and church-state studies at Baylor University. In 2007, Beckwith wrote Defending Life: A Moral and Legal Case Against Abortion Choice, which is widely regarded as one of the strongest books defending the pro-life position. According to Beckwith, Christians should work with all people of goodwill who are pro-life.